Along with the 2018 Audi Q5, Audi has listed the 2018 Audi A8 L on its Indian website. The all-new Audi A8 L is “coming soon”, Audi says. The sedan made its debut earlier this year in July in Barcelona and should reach dealerships in India in the first half of 2018. Audi will sell the new generation Audi A8 in India exclusively in the long-wheelbase version. The latest development is an indirect confirmation that Audi will sell the new generation Audi A8 exclusively in the long-wheelbase version, as has always been the case. The 2018 Audi A8 L measures 5,302 mm in length, 1,945 mm in width and 1,488 mm in height. It is 37 mm longer, 4 mm narrower and 17 mm taller than its predecessor. Audi has extended the A8 L's wheelbase by 6 mm to 3,128 mm. The all-new A8 L has more headroom, shoulder room, and leg room. The 2018 Audi A8 L is available with two engines options currently: 55 TFSI and 50 TDI. Audi may offer both of them in India at launch. The A8 L 55 TFSI is powered by a 3.0-litre TFSI turbocharged V6 petrol engine that produces 340 PS and 500 Nm of torque. The A8 L 50 TDI uses a 3.0-litre TDI turbocharged V6 diesel engine that develops 286 PS and 600 Nm of torque. The 8-speed tiptronic automatic transmission and the Quattro permanent AWD system are standard in the A8 L 55 TFSI and A8 L 50 TDI. For the first time, the Audi A8 L’s engines are equipped with mild-hybrid technology as standard. The 48-volt system has a belt alternator starters (BAS) and a 10 Ah lithium-ion battery, and it functions as the main vehicle electrical system for the first time in the flagship saloon. It allows a high recuperation power of up to 12 kW, as well as start-stop operation from 22 km/h. Thanks to the mild-hybrid system, the all-new Audi A8 L can coast with the engine off. In the speed range of 55-160 km/h, if the driver releases the accelerator, the vehicle can\ travel as a zero-emissions vehicle for up to 40 seconds. When the driver steps on the gas pedal again, the BAS gets to working for a for a swift and smooth restart. 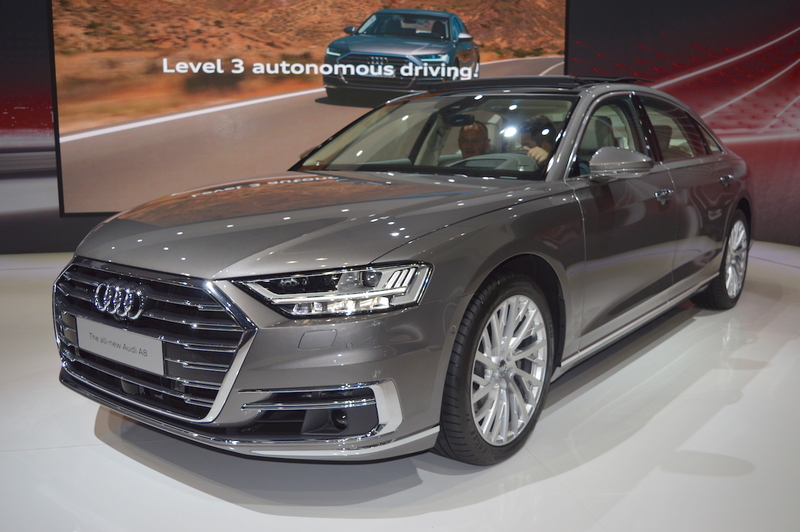 The 2018 Audi A8 L is the world’s first production car to offer Level 3 autonomous driving. There are three new Audi AI systems at work for this: Audi AI traffic jam pilot, Audi AI (remote) parking pilot and the Audi AI remote garage pilot. With the Audi AI traffic jam pilot, the car can autonomously drive itself in a slow-moving traffic on the highway up to 60 km/h. The other two Audi AI systems let the car drive independently and without a driver into a parallel or right-angle parking space, or forward into a garage. Other highlights of the 2018 Audi A8 L include HD Matrix LED headlights with Audi laser light, 21-inch wheels, homogenous-beam OLED rear lights, panoramic glass sunroof, 12.3-inch Audi virtual cockpit, 4-zone climate control, ventilated front and rear seats with massage function, dual central display comprising a 10.1-inch infotainment system screen and an 8.6-inch screen for temperature and comfort controls, 5.7-inch OLED tablet rear seat remote and a 1,920-watt, 23-speaker Bang & Olufsen Advanced Sound System. Audi may offer the 2018 Audi A8 L with the 3.0-litre TFSI petrol and 3.0-litre TDI diesel engines at launch. The 2018 Audi L is likely to arrive in India via the CBU route, and this could mean a starting price upwards of INR 1.2 crore (ex-showroom). Its production takes place at the Neckarsulm plant in Germany. The 2018 Audi A8 L's launch will follow that of the 2018 Audi Q5 launch.